We are an independent florist / flower shop in the town of Biggar Lanarkshire providing flowers for all types of occasions or “just because” flowers. We supply baskets, bouquets, vases, plants and for all the occasions you would need a florist for … anniversaries, new baby , weddings, funerals, new home, Valentines, Mother’s day, Easter or just any time to cheer someone up. We offer a friendly. personal service with a knowledgeable touch you would expect from a good florists shop. We hope you enjoy our site which is a mixture of the serious side of a flower shop and the fun side …… so go on don’t stop at this page … read on and be part of our florists in Biggar ……We look forward to meeting you and talking to you. You can see us featured in The Good Florist Guide. 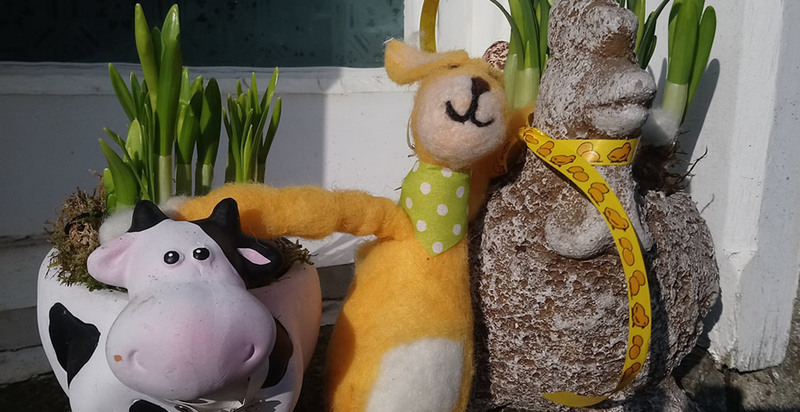 Our friendly bunch of scented animals have arrived in the shop for Easter gift ideas…free range and fat free, a perfect alternative gift instead of that easter egg which just does not taste like it used too! !,or only has two chocs inside it , compared to 4 a couple of years ago! !…We will be open,Easter Friday, Saturday and Sunday with a stunning array of gifts! !…see you then and oh…we will be also delivering flowers, Easter chicken’s, cow’s, rabbit’s…a perfect Easter gift. Have a look at our latest flower gallery.